Maroun N. Chammas , Chairman,CEO , and Managing Director at Berytech. Berytech Fund specializes in investments in seed, start-ups, and early growth companies. The fund seeks to invest in communications technology and software companies. BEIRUT: The Maroun N. Chammas (MNC) Recognition Award launched on October 11 a commitment of funding on an annual basis and for the next ten years; $50,000 as a reward of groundbreaking technology innovation and $25,000 as a reward of excellence in sporting accomplishments. The successful Lebanese entrepreneur with activities ranging from Oil and Gas to Telecom and F&B, as well as technology and innovation, Maroun Chammas, stressed on the matter of encouraging young people to stay in Lebanon and help its local economy. 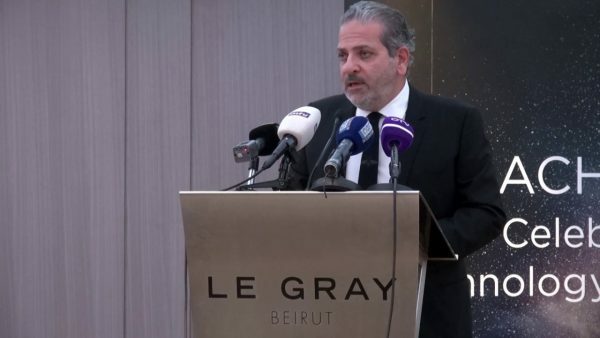 He delivered his speech in a press conference held at Le Gray hotel Beirut in the presence of MPs Nadim El Gemayel and Tony Franjieh, along with close colleagues, friends, and family. The annual award for technology innovation aims to encourage, recognize and reward people who have truly created trendsetting technology products, according to his statement. Participants will help create economic growth in Lebanon as soon as the product hits the markets. They will incorporate companies, generate new job opportunities, and develop manufacturing infrastructure, services and other vehicles. The applicants should focus on a specific technology area which was chosen by the award team and holds the following: artificial intelligence or machine learning, virtual and augmented reality, 3D printing, cloud computing, cybersecurity, renewable energy and many more. In parallel, these innovations and products should address to one of the following market segments, which are identified as focus market segments by the award team: accessories, gaming, healthcare, automotive and many more. The high-tech product executive and former President of Nokia Technologies, Ramzi Haidamus, who was also a member of the judging panel, explained that Chammas was his inspiration to becoming a judge on the MNC. He also said that ever since he was a child, he continuously pushed the limits around him to achieve new levels of creative success in his professional and personal life. “Maroun’s generosity and kindness are rare to find in today’s world, and Lebanon is lucky to have him looking out for young talent,” said Haidamus. The MNC recognition award for sports excellence aims to be in harmony with the Olympic values of excellence, friendship and respect. Under the auspices of the Lebanese Olympic Committee, as well as the Lebanese sports federations for Taekwondo, Fencing and Swimming, the award will help Lebanese athletes reach their full potential and, not only represent Lebanon at the Games, but at international competitions as well. However, the candidates must be affiliated to one of the federations mentioned above to be able to apply. The application criteria were loudly clarified by Jihad Salameh, the international certified lecturer in sports administration. Besides being affiliated in one of the federations, applicants must be Lebanese and living in Lebanon, between the ages of 15 and 18 years old, and should demonstrate individual social behavior in line with the fundamentals of Olympism. The finalists of each category will be evaluated by a judging panel consisting of prominent Lebanese businesspeople, as well as renowned sports figures. One of the voting voices will be given collectively to Chammas’ children. “I hope that these awards will inspire athletes in the future years and give them the opportunities to achieve their goals, because if they work hard and are confident, then nothing can stop them from fulfilling their dreams,” said Salameh. The management of this award has been granted by the Award Committee to Berytech, the ecosystem for entrepreneurs in Lebanon. The applications deadline will be on December 11, the evaluation and shortlisting by the committee will be appointed in January 2019, and the VIP dinner during which the winners will be recognized and rewarded will be set by February 2019.